Making that break with food often begins with a disastrous weight-inspired event. For one British grandmother, breaking the sofa inspired her to get fitted with a gastric sleeve. 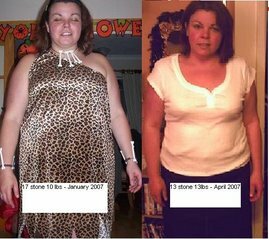 And in just a year the woman, who weighed 27 stone, lost more than 10 stone! While I haven't been involved in any breakages in recent years, I can safely say that I've noticed seats becoming tighter and more uncomfortable. On my last plane journey, for example, the seat belt was extended to its maximum. It's going to be a little while until I take my next flight, so I'm aiming to have at least a few inches spare on my next trip. Closer to home, I've noticed that my white plastic garden chairs are such a tight fit that I have to sit on the edge. With this in mind my short-term goal is to be able to sit properly in one by the end of the summer! Tonight is my third weigh-in with Slimming World. I'm not sure if I should feel relieved or worried, but I had no nightmares about gaining/overeating last night. I've been sticking to the plan and eating my syns - nothing more, nothing less. I'm also feeling more comfortable with making food choices. I have a few breakfasts, lunches and dinners to choose from... and I'm always on the prowl for more.